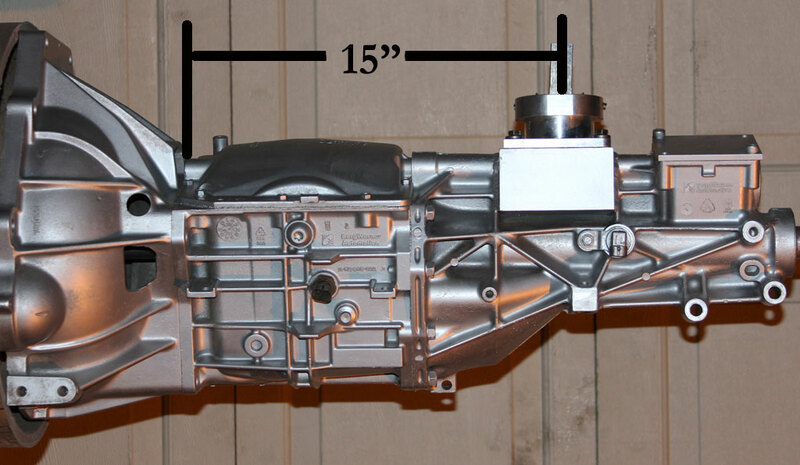 It's usually easy to add a T5 transmission to your driveline. However, if you want to keep both your bench seat and keep the original cable speedometer, then you might have a tough time accomplishing ALL THREE. The S10 tail housing with a cable speedometer connection is becoming harder and harder to find. FORD and Chevy guys like them for their bench seat cars and trucks. Prices have really gone up if you can find one at all. A T5 with a Camaro tail housing has the shifter in the wrong location for a bench seat. The 1989 through 1993 S10 tail housing will let you keep the bench seat but the speedo connection is electronic pulse and then you can't run the cable speedo unless you buy a $300 aftermarket part that converts it back to cable drive. The 1982 through 1988 S10 cable connection T5s are nearly impossible to find. Ok, so I want to put a Camaro T5 in my truck and keep the bench seat and keep my cable speedo, but I can only find an S10 tail housing with a pulse style speedo connection. What are my options? Option 1: Convert to bucket seats and let the Camaro shifter come up through the floor between the seats. You get to keep the cable speedo connection since almost all 1982-92 Camaro T5s had a cable speedo connection. Option 2: Swap the Camaro tail housing with a pulse style S10 tail housing so you can keep the bench seat. You will no longer have a place to connect your speedometer cable so you'll have to figure out another way to measure your speed. GPS maybe? Option 3: I cannot take any credit for the solution given below. I am very impressed with the creativeness of the person who came up with this modification. I think it can still be improved upon depending on the application. 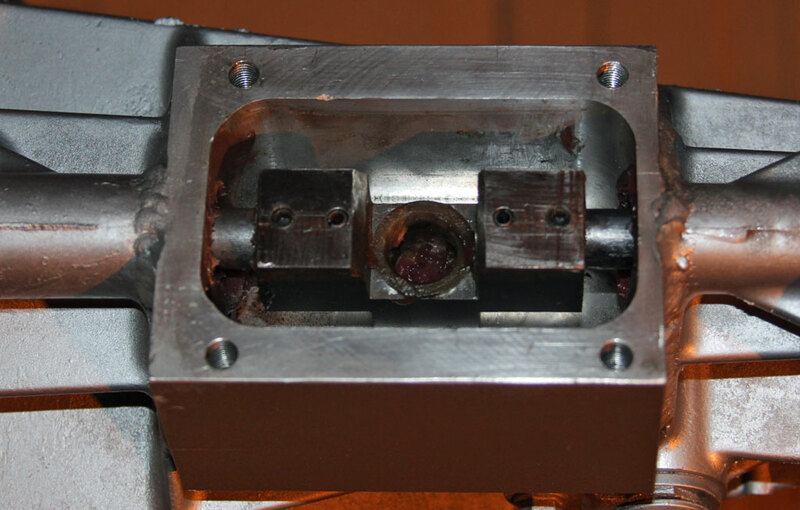 The basic idea is to build another shifter box and graft it into the Camaro tail housing. It will end up very close to the S10 shifter box location. 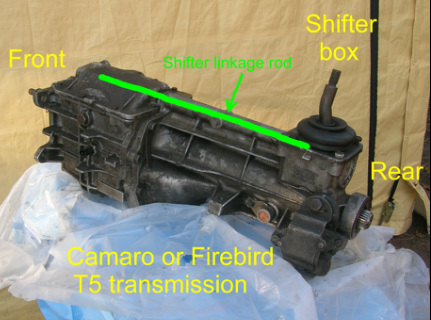 These photos show a shifter box that is further back than the S10 position. It could be moved to the S10 shift position if that is where you want it. Here's a photo showing someone else's modification of a Camaro T5. Notice that they used the original Camaro tail housing and grafted in a fabricated shifter box and shifter handle. 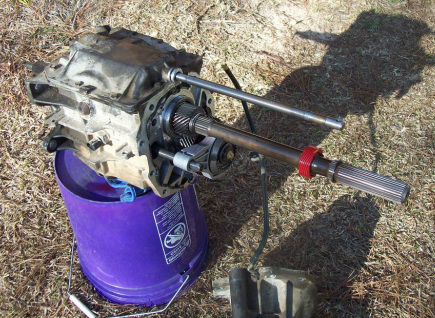 A Camaro shift linkage rod travels the entire length of the tail housing to the shifter box. The second photo shows a Camaro T5 with the tail housing removed. What modifications were done to create a new shifter location? 1. Remove the Camaro tail housing and cut out a section that is the same size as the shifter box you plan to insert. You can choose a Mustang or Chevy T5 shifter handle. A Mustang shifter box is longer than a Chevy shifter box. Plan ahead by choosing the shifter first and then graft in a shifter box that will match the shift handle base plate. Here's the same Camaro tail housing with the shift linkage rod back in place. Next, you need to create a new shifter connection that will exactly duplicate the original linkage movements. The photo below shows a newly fabricated offset lever that requires removing a short section of the shifter rod and reconnecting it on each end of the new offset lever. SUGGESTION: Here's how I might construct a new offset lever. I'd join 2 original Borg Warner offset levers. Just cut away the areas shaded in yellow so the toe of one will overlap the toe of the other with the hole aligned down the middle. I think it would be stronger. They could be joined with roll pins. 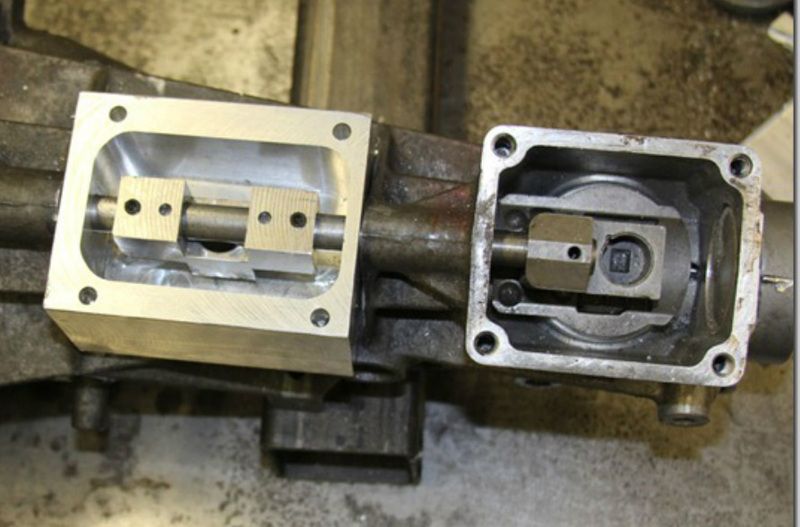 A solid aluminum block is milled out to create a new shifter box. With this setup, it will be the rear shift box, offset lever and shift pattern detent plate that will guide each gear shift just like it did from the factory. Thus, the newly fabricated box does NOT need a shift detent plate. That's brilliant! Make a few trial shifts to make sure there is no jamming or interference inside the new shift box. If everything checks out OK, secure the new offset lever on each end with roll pins and aluminum weld or epoxy the new shifter box into place. Then cut away the rod above the hole in the offset lever. The rod length will be exactly the same as it was from the factory. You may have noticed that the new shifter box in these photos is tilted at a different angle than the factory box. The guy who developed this modification did this on purpose to change the angle that the shifter came up through the floor of his car to suit his needs. However, the new shifter box does NOT need to be installed in a tilted position. A short throw style shifter has been installed (owner's choice). Next a cover plate will seal the rear box. The example below has the new shifter box further back than the S10 position. I see no reason why the same modification couldn't be done a few inches more forward (in the S10 position).